Chapman University offers students, faculty, and staff a number of incentives in exchange for using more sustainable commuting options. Small changes can have significant impacts on our contribution to air pollution and lessen our collective use of limited resources. Chapman University wishes to encourage this behavior and offers a variety of incentives, discounts and rewards that will make it worth your while to explore these options! The Human Resources Department offers three Rideshare programs aimed at saving you money AND reducing your carbon footprint. Whether you are looking for a carpooling group or public transportation options, or maybe you plan on going car-free, Chapman wants to reward you for it. Carpools: This program is offered to full-time Chapman faculty, staff, and commuter students. Get together with other members of the Chapman community and start a carpool! Limiting the number of single passengers trips you take is a great way to reduce your own carbon footprint. Plus, carpooling is a great way to save money, make some new friends, and be guaranteed a sweet parking space! Public Transit: Both full- and part-time faculty, staff and commuter students are eligible to participate in the following two programs. Chapman U-Pass Plan for OCTA Bus Riders: Receive a discount to use Orange's public transportation. Metrolink Corporate Pass Program: Get passes for the Metrolink at a discounted rate. Zipcar: Chapman students, faculty and staff are eligible at a special discounted rate. Zipcar offers a variety of cars that can be rented by the hour, for those who need a car for short trips and errands. 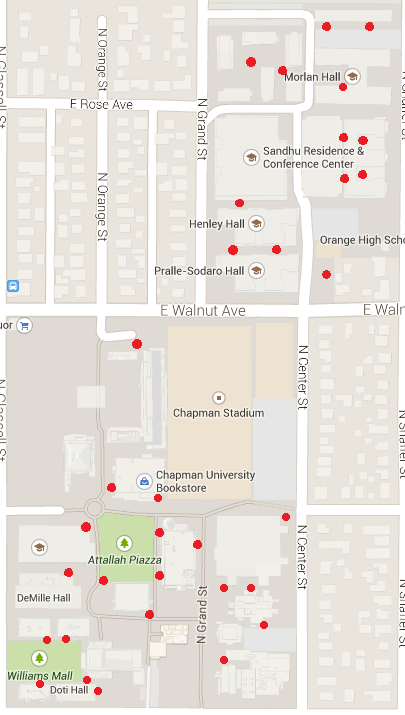 Chapman University has 4 Zipcars on campus! Gas, insurance and up to 180 miles per day are included in the cost of renting the Zipcar. Zipcar's website contains extensive details and easy-to-follow instructions. To sign up or to find additional information on these programs, visit the Rideshare Incentive Programs page. Any questions regarding these programs can be directed to the Human Resources Office. The Bike Voucher Program is offered to current Chapman students, faculty, and staff who meet the eligibility requirements. Those who qualify will receive a voucher worth $300 that may be used at one of the local bike shops listed below to cover the cost of a bike, a U-lock, and a helmet, or to upgrade your bike for commuting purposes. In exchange, you will relinquish your right to purchase a Chapman parking permit for the next 2 years. This program is a great way to cut down on the costliness of motor vehicle transportation, improve health, and lessen your contribution to air pollution. Read more about the Bike Voucher Program. If you do not see your preferred local Orange shop listed, contact us at sustainability@chapman.edu and we will work to contact them about our voucher program. Apply: Applications are reviewed on a first come first served basis. Sign in to Chapman Engage and click on Bike Voucher Program. Bike racks are set up outside nearly every building on campus and all the on-campus housing. This map indicates the locations of these racks. Don't forget to lock up your bike! Racks are continually being added to accommodate the growing number of Chapman community members cycling to campus as an alternative sustainable transportation method. Beeline Bikes Mobile Bike Shop is a company that has partnered with Chapman University to provide a wide range of services to students, staff, and faculty. They will be offering consultations, tune-ups, repairs, parts, and more. Members of the Chapman community can sign-up for Beeline Bike's services and find out more information about the company and their pricing at Beeline Bikes. Chapman University currently offers electric vehicle charging. In order to utilize these chargers you must create an account with Chargepoint. To set up an account, follow the directions below. Sign up to get a free card: If you aren't a member, sign up. Activate your card: When your card arrives by mail, just log in, go to My Account, and follow the instructions under Set Up ChargePoint card. You can also get more help with ChargePoint cards. Download the mobile app to start charging now: Get the mobile application. 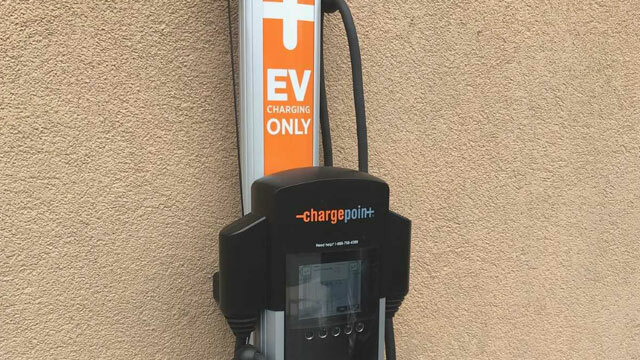 Find the station nearest you: Just use your ChargePoint mobile app when you're on the go or view our online map of charging stations. Charging your electric vehicle:Found a charging spot? Great. Tap your ChargePoint card over the reader symbol, press the handle button to remove the charging connector, and simply plug in. After you're done, tap your card to end the session, then unplug the connector and return it to the station. You can also sign up and start a session all from the ChargePoint mobile app.